Below are the Net10 Wireless deals and promotions for April 2019. If you are interested in signing up or buying a phone from Net10 Wireless check out the deals below and you could save some money. 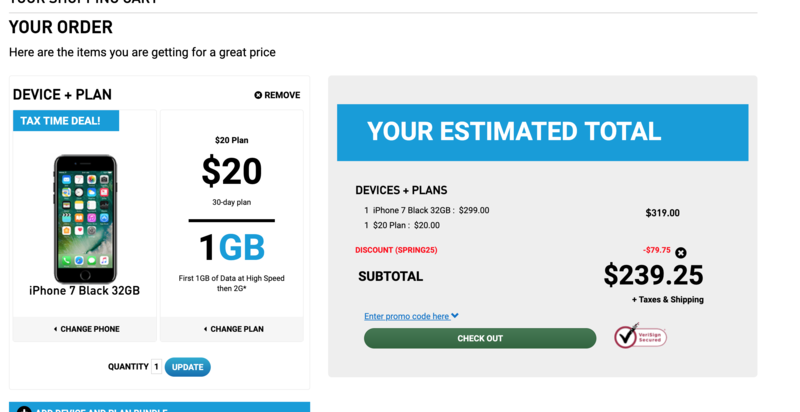 For April 2019, you can save 25% off when you buy a phone and plan from Net10 Wireless. Enter the promo code SPRING25 in the cart. The maximum savings is $100. This offer is valid until April 1 while supplies last. Even better for April 2019, I checked and I was able to use the SPRING25 discount code with all of the Apple iPhone and Samsung Galaxy models in stock. Net10 Wireless has the iPhone 7 and iPhone 6s in stock this month. Use the discount code SPRING25 for additional savings. Net10 Wireless has the Galaxy J3 Orbit in stock. For April 2019 you can buy use the promo code SPRING25 to save 25%, up to $100. Galaxy Samsung Galaxy J3 Luna Pro with $20 plan for $48.